The Aorta is the major blood vessel that carries blood from the heart to all of the organs and limbs. It is divided into several parts: The ascending aorta, arch, descending thoracic aorta (in the chest) and the abdominal aorta. An aneurysm is a localised dilatation/ballooning/swelling of any blood vessel. These occur most frequently in the abdominal aorta but may occur in any part of this major artery, or in other parts of the body. Other aneurysms most commonly related to those in the aorta include popliteal artery aneurysms (behind the knee) and femoral artery aneurysms (in the groin). Other common aneurysms (though not necessarily related) include cerebral aneurysms in the brain. Aortic aneurysms are a serious problem with the risk of rupture or bursting being a cause for sudden death. Rupture (the most feared complication) will mostly occur without any prior warning of the aneurysm even being present. The exact cause of aneurysmal disease is yet to be fully elucidated. Generally, the majority of aneurysms are thought to be due to a degenerative inflammatory process that affects the strength of the aortic wall. Aneurysms are most common in men (though do also occur in women) and increase in incidence with increasing age. Aneurysms also seem to be becoming more common in our society above and beyond the aging of our population. Aneurysms can run in families indicating a genetic predisposition and it is important to screen family members of those with aneurysms or those with a previous family member who has had an aneurysm. Aneurysms are rarely seen however before age 50 years (except in families with known connective tissue diseases such as Marfans Syndrome) so screening (with ultrasound) should be delayed until this time. It is also important to remember that if an aneurysm is not present at age 50, it can still develop later so screening on a regular basis (3-5 year intervals) would be recommended. There is a growing interest around the world in screening for aortic aneurysm disease (similar to screening programmes for breast cancer), including programmes introduced in the United States. No official screening programme has been introduced as yet in Australia. It would be reasonable however to consider talking to your GP if you feel you may be at risk. At risk includes particularly men aged over 55 years of age with a history of past or present cigarette smoking, and anyone over age 50 years of age with a first degree relative (eg parent or brother/sister) with a known history of aortic aneurysm. Screening can be performed with a simple and non-invasive ultrasound examination of the abdomen. 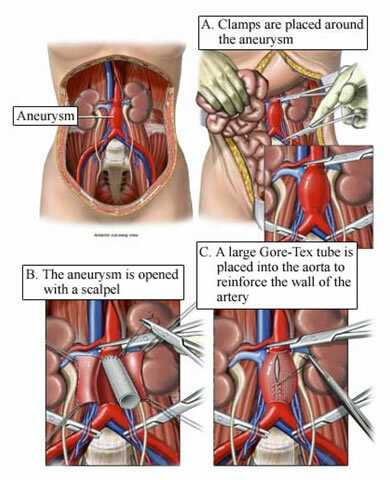 Figure 2: Operation showing a large aneurysm of the abdominal aorta. 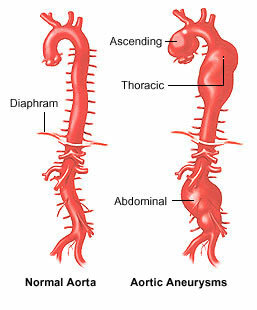 The majority of aortic aneurysms do not have symptoms. In the past, the most common way of identifying an aortic aneurysm was when they ruptured, leading to massive internal bleeding – unfortunately too late for most people. Rupture of an aortic aneurysm is generally regarded as a fatal condition. Whilst some patients who collapse with this will make it to hospital, most will die at home. Of those that do make it to hospital, approximately 50% will still not survive – a figure that has not improved around the world over many decades despite improvements in surgical techniques and intensive care treatment. Thankfully, the majority of aneurysms are detected early these days and are found incidentally when patients have ultrasounds or CT scans for other problems or symptoms. Early detection of small aneurysms allows them to be closely monitored and larger aneurysms to be treated before they can rupture. If the aneurysm itself presents with symptoms, this is considered a surgical emergency. Diagnosis of aortic aneurysms is generally based on clinical examination and ultrasound examination. CT scanning however is generally required once an aneurysm reaches a size where treatment is being considered to better determine the anatomical relationship of the aneurysm to the branches of the aorta including especially the arteries to the kidneys (renal arteries) and to the legs (iliac arteries). The operative treatment of aortic aneurysms aims to prevent the aneurysm from rupture and thereby improving the life expectancy of the patient. There are several factors that are important to take into consideration when managing patients with aortic aneurysms. Determining the life expectancy of the patient, rupture risk of the aneurysm, and operative risks are some of the first steps. Aneurysms that are symptomatic are potentially life-threatening emergencies, and emergency or urgent surgery is an important potentially life saving procedure. The surgical risk in this situation is however much higher than when elective treatment can be planned. Aneurysms greater than 5 – 5.5 cm in the infrarenal abdominal aorta or greater than 6cm elsewhere in the aorta The rupture risks of aneurysms are directly related to their maximal diameter (but unrelated to length which you may see reported on ultrasound or CT scan examinations). Thankfully, due to earlier identification of aneurysms, the majority of aneurysms are amenable to minimally invasive treatment these days. This involves generally a large incision in the abdomen with exposure of the aorta as it lies on the vertebrae (spine), moving all the bowel out of the way. 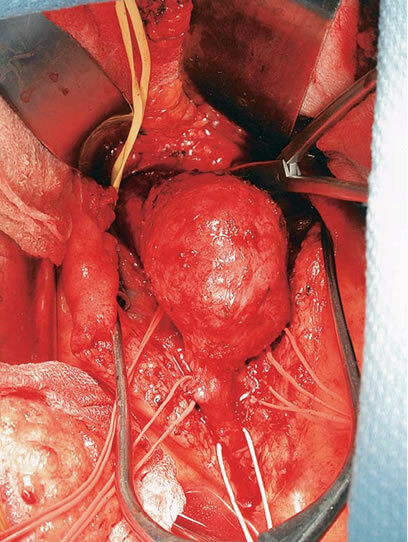 The aorta is then clamped, as are the arteries to the legs below the aneurysm, allowing the aorta to be opened, and a “new” synthetic aorta (graft) to be sewn to normal artery above and below the aneurysm. 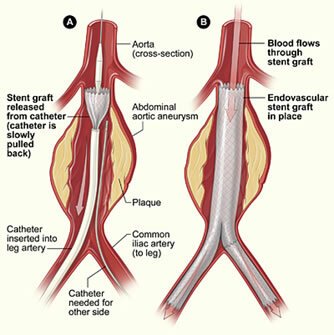 The aneurysm is then “closed over” the graft to protect it from coming into contact with the bowel. The operation has very good long term success but is a high risk surgical procedure, similar in risk (or some say higher risk) than open heart surgery. This involves inserting a “sleeve” into the aorta through the arteries in the groin (femoral arteries). This is “minimally invasive” repair, being done either through small incisions in each groin exposing the arteries or increasingly being done “percutaneously” (no open exposure of the artery) via very small incisions and special devices to “seal” the arteries on completion of the procedure. Recovery is much faster than open repair with lower risk and much less blood loss. There are however more potential problems in longer term outcomes requiring regular observation with either ultrasound or CT scanning and potentially further procedures (either minimally invasive or open surgical). For more complex aneurysms, there are further developments in minimally invasive procedures or mixed open and minimally invasive procedures making more options available for treatment of these aneurysms. Further information regarding the treatment options and the risks and benefits of each can be obtained during consultation with one of our doctors.